(Sacramento, CA-AP) – Community leaders are demanding justice after a pair of Sacramento police officers were not charged in the shooting death of an unarmed black man. Various faith leaders and the NAACP spoke out against the DA’s decision to not hold the officers accountable for 22-year-old Stephon Clark’s death last March on Saturday. The leaders said Saturday’s decision is a testament to a justice system that doesn’t protect the black community, but rather persecutes it. Sacramento NAACP President Betty Williams slammed the DA for defaming Stephon Clark post-mortem in an effort to justify the actions of the two police officers who shot Clark eight times in his grandmother’s backyard. The DA suggested Saturday that Clark being under the influence of drugs and alcohol and also the fact that he had relationship issues were factors that had to be considered in her decision to not charge the officers. The leaders stressed that the fight for justice isn’t over and they plan to lobby city officials until the two officers who killed Clark are removed from the police force. (Sacramento, CA) – A Tallahassee attorney known for taking on controversial civil rights cases has been retained by the family of an unarmed black man who was shot and killed by police in California last week. Benjamin Crump gathered at Sacramento City Hall yesterday with Stephon Clark’s family members, the NAACP, and leaders of Black Lives Matter. He pointed out that white suspects in the South Florida high school massacre and the Texas package bombings were not shot, while the unarmed Clark was shot 20 times. Crump has represented families of victims in other shooting cases including Trayvon Martin, Michael Brown and Tamir Rice. (SL) – Heavy support for 29-year old Colin Kaepernick continues to grow after the QB still has yet to get back on a team in the NFL. NFL Commissioner Roger Goodell insists that there’s no coordinated effort to bar Kaepernick. But many question why one of the top QBs, who led San Francisco to the Super Bowl in 2013, doesn’t have a job. The former San Francisco 49ers offensive leader was at the heart of a controversial silent protest last year when he began kneeling during the national anthem to demonstrate against police brutality and racial injustice. He was subsequently released by the team at the end of last year’s season and has yet to be picked up by another franchise. On Wednesday, hundreds of fans attended a demonstration in front of the NFL’s main offices in Manhattan. His fans believe wholeheartedly that he is being blackballed. The issue has raised a national debate in some quarters as to whether athletes should be engaged in political demonstrations on the field. Other players have followed Kaepernick’s example, refusing to stand up for the anthem in a gesture both in support of Kaepernick and his stance against racial discrimination. On Monday, at least 12 members of the Cleveland Browns refused to stand for the national anthem, the largest on-field sign of solidarity by an NFL team yet. (SL) – After such a violent death, Alton Sterling looked peaceful as family members and friends said goodbye to the 37-year old who was shot dead by two white police officers who pinned him down outside a convenience store in Baton Rouge where he was selling CDs. Thousands of people attended the funeral at Southern University to remember the father of five whose slaying sparked a wave of protests across the country. His aunt Sandra, still overwhelmed by his death ten days ago, had to be restrained by two men as she walked past her nephew’s body. Sterling’s death was captured on cellphone video and circulated widely on the internet. His death, along with another fatal police shooting in Minnesota last week, sparked widespread outrage among many African-Americans over the treatment of blacks by police. Among the mourners was Claire Carter, who came to Sterling’s visitation inside the basketball arena at Southern University, a historically black college in north Baton Rouge. She, like so many others, said she wanted aggressive policing to end. Sterling’s encounter with police ‘went too far’ when officers tackled him and used a stun gun on him, she said. Police have said they found a gun in his pocket. But no gun is visible on the video. Carter said she bought a rhythm and blues CD from Sterling about a year ago and took it out and played it again after his death. Sterling’s funeral started with a gospel choir singing hymns, as many in the crowd of a couple thousand joined in. Gary Chambers, a spokesman for the Sterling family and master of ceremonies for the funeral, said at the beginning that the event was intended to be a celebration of Sterling’s life – not an opportunity for demonstrations about his death. ‘If you want to protest please leave now,’ he told the crowd, which included two senior advisers to President Barack Obama. Sterling was selling CDs outside the store, as he had done for years, when he was killed by police responding to a call of a man threatening someone with a gun. 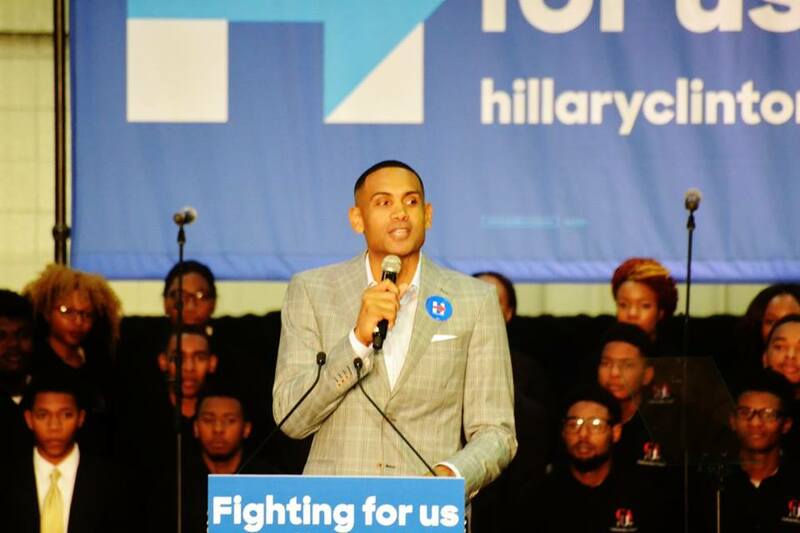 (SL) – The Hillary Clinton for African Americans Event went down on Friday in Atlanta and of course Sytonnia LIVE was on location at CAU’s Epps Gymnasium which was full of Clinton supporters and non-supporters. Some of Atlanta’s most influential people took part in the rally. Mayor Kaseem Reed, Congressman John Lewis, Atlanta Hawks Owner Grant Hill and many more. But what started out as a peaceful gathering quickly turned into chaos. As Hillary As Hillary referenced our civil rights leaders and following their methods for change…the interruption came from the back. Hillary stood firm as they got louder A few men moved in to try and encourage the group to leave quietly. At first, the former secretary of state acknowledged them: “Yes they do and I’m gonna talk a lot about that in a minute,” she said. She then tried ignoring the protesters, shouting her remarks over the chants. “I have some issues to discuss and proposals to make if our friends will allow me to do it. They may actually find them to their liking,” Clinton said, while continuing to speak over the disruption, one of the loudest she had faced on the campaign trail. At this point, mind you, they are standing in front of the mayor, Congressman Lewis, Usher etc. The Mayor looked to be in disbelief. His wife remained in her seat. Congressman Lewis tried to get the group to leave. The crowd eventually started chanting..let her talk and Hil-la-ry. It was so bad the Mayor and Congressman Lewis went back on stage and stood firmly behind Hillary. The secret service formed a strategic circle around the platform. Finally, the group was escorted out. 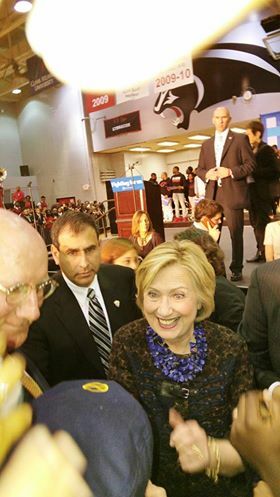 Once the chaos cleared, Hillary said and I quote….”I would like to thank Mayor Reed and Congressman John Lewis for having my back!” Lol I chuckled a little.